Shazam! is one of the best movies DC has made save for Wonder Woman; endlessly entertaining, a ton of heart while making plenty of meta-commentary on the superhero genre. Summary: We all have a superhero inside us, it just takes a bit of magic to bring it out. In Billy Batson’s case, by shouting out one word – SHAZAM! – this streetwise fourteen-year-old foster kid can turn into the adult superhero Shazam. Fans of DC movies can finally rest easy; it looks like they finally have this thing figured out. It’s been kind of a rough road for the second of the big two in comic book movies but after Aquaman made a billion dollars it looked like things were on the right track. Now we have Shazam! and it proves that DC is very much on the right track. Shazam! is the best DC movie since Wonder Woman. In fact, on a purely technical standpoint, it is actually better than Wonder Woman. Wonder Woman will be the movie that will have more impact culturally but Shazam! doesn’t fall apart in the third act the way that Wonder Woman did. Shazam! follows the story of 15-year-old Billy Batson (Asher Angel) as he moves into a group home after running from foster families. Billy finds himself in the weird situation of becoming an adult superhero (Zachary Levi) when the wizard Shazam gives Billy his powers. However, despite looking like an adult Billy is still very much a kid and is unprepared for what happens when a supervillain (Mark Strong) shows up. Shazam! doesn’t pull its punches when it comes to Doctor Sivana. The scenes with Sivana are the kind of scary that a lot of family movies don’t go to very often these days but will be familiar to anyone who is a fan of kid films from the ’80s. Levi and Angel do a really good job of making Billy the kid and Billy the adult feel like the same person. That’s not an easy thing to pull off and it’s very clear that Levi and Angel put in the work to make sure that the change between adult and kid didn’t ruin the immersion. Strong is clearly having a ball getting to cut loose with Sivana in a way he was denied in his last foray into the DC universe. The various foster kids, aside from Jack Dylan Grazer as Freddy Freeman, don’t that much development but the door is open to learning a lot more about all of them in a sequel. 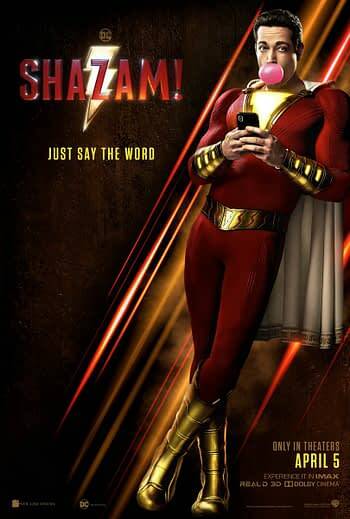 There really aren’t anything bad things you can say about Shazam!. It’s over two hours long but the pacing remains steady. It’s funny but it clearly isn’t trying too hard to be funny. The stakes are clear and you can understand why everyone is acting the way they are. The moments with Sivana might be dark but they don’t make the movie feel off as far as tone. The juxtaposition between those dark moments and the humor work flawlessly. The DC universe worldbuilding is left more or less to Easter Eggs and the throwaway jokes which is the best way to do it. The suit, which has been a point of contention, looks great and all of the special effects look solid. Shazam! is not only one of the best as far as DC superhero movies go but it absolutely deserves a place in the top ten of the genre overall. This is one of the good ones and worth checking out when it comes next month.